And yet, most of us are at the mercy of it in one way or another. Some are afraid to start things for fear of falling short. Others start, but are afraid to finish for the same reason. But it isn’t about not attaining perfection. It’s probably about being judged for imperfection. It’s about other people affirming the “less than” feeling we already have about ourselves. 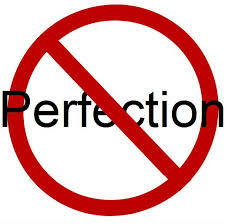 Allowing the impossibility of perfection to influence our action or inaction is destructive. It prevents us from putting forth the best of ourselves. The gifts that we hold go unrealized in the world around us. Not only do we miss the opportunity to positively impact others, we also lose the blessings that may have come back to us as a result of our offering. What’s your relationship with perfection costing you? What is it costing others?